For the first time in a residential formula near to the lake of Bracciano, just 50 km from Rome. 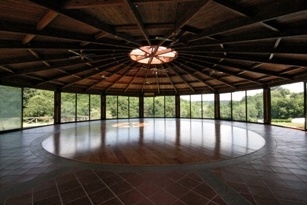 Four days of CONTACT: lectures, guided warmups, body work, live music … and especially lots of space for the JAM! This year we will move to “Borgo Paola” www.borgopaola.com, a beautiful estate surrounded by nature, we will dance in a beautiful circular room with large glass windows. From the “Borgo” you can reach the lake along a trail through the woods. Accommodation can be in rooms with a bathroom (double or triple), or in a common room using your own mattress and sleeping bag (limited places). The cuisine is vegetarian, tasty and healthy. To enroll, send an email to info@romacontact.com containing your personal data and then paying a deposit of 60 euros to the bank account that’s number will be sent to you. Cancel your reservation up until the 30th of September and you will be refunded 90%; 50% up until the 15 ottobre. After that date we cannot refund for organisation reasons. – The facility will be managed entirely by the organization and participants, so will need the cooperation of everyone – short work turns will be organized. – Both places in the dormitory and in the rooms are limited in number, so you should book as soon as possible. – Linen will not be provided by “Borgo Paola.” Those who stay in the rooms must bring sheets and towels, those staying in common room will need a mattress, sleeping bag and towels. BY TRAIN: from Roma Trastevere and Ostiense there are trains every 30 minutes, the closest station to the town is “Bracciano” from there we will organize lifts.